COLLAPSIBLE STADIUM HORNS. 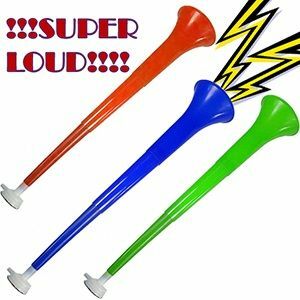 SUPER LOUD!!!!!!!!!!!!!!!!! Let your team know that you are cheering for them with these crazy noisemakers. Just blow into the tube and hear them roar! Assorted colors. Sorry, no color choice available. Each polybagged. Also perfect for St. Patrick's Day and Mardis Gras parties.